Benjamin Franklin's wildly dangerous kite experiment has grown into an American legend. Almost everyone has heard of Franklin flying a kite with a key in an electrical storm, but few of us actually understand how the experiment works. Ben hypothesized that lightning is an electrical phenomenon, and that the electrical effect of lightning might be transferable to another object and cause an effect that could be recognized as electricity. He set out to prove it in an experiment. In 1752, on a dark June afternoon in Philadelphia, the 46 year-old Ben Franklin decided to fly a kite. With the help of his son, William, they attached his kite to a silk string, tying an iron key at the other end. Next, they tied a thin metal wire from the key and inserted the wire into a Leyden jar, a container for storing an electrical charge. Finally, as the sky darkened and a thunderstorm approached, they attached a silk ribbon to the key. Holding onto the kite by the silk ribbon, Ben flew the kite and once it was aloft, he retreated into a barn so that he would not get wet. The thunder storm cloud passed over Franklin's kite, whereupon the negative charges in the cloud passed onto his kite, down the wet silk string, to the key, and into the jar. Ben however, was unaffected by the negative charges because he was holding the dry silk ribbon, insulating him from the charges on the key. When he moved his free hand near the iron key, he received a shock. Why? Because the negative charges in the key were so strongly attracted to the positive charges in his body, a spark jumped from the key to his hand. 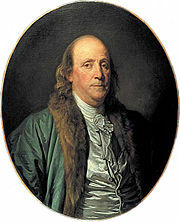 Franklin's experiment successfully showed that lightning was static electricity. You can experience this same reaction when you shuffle your feet on a carpet and reach for a metal doorknob. Franklin was actually lucky to have survived, for after this famous incident, several other would-be-scientists who performed this same kite experiment were electrocuted. Realizing that this form of electricity could be charged over a conductor and into the ground, he invented the lightning rod and conductor, providing the lightning an alternative path to the earth. Later in his life, lightning struck his own house, but his lightning rod saved it from burning. To understand lightning, it helps to learn a little about electricity. After all, lightning is a form of electricity. A quick way to learn about electricity is to learn about static electricity. You have probably experienced static electricity. It's the charge that you create when you scuff your feet on a rug. Then when you touch a doorknob, you get a small shock. That's static electricity. The reason why it works is a little more complicated. To start, you have to know that every object is made up of billions of tiny particles, called protons and electrons. These particles are so small they can only be seen with special microscopes. Despite their small size, protons and electrons carry an electrical charge. Protons carry a "positive" charge, while electrons carry a "negative" energy charge. Usually, the two different charges balance each other out, and nothing happens. But when two objects with like charges (all positive or all negative) come together, the charges repel and the objects move away from each other. Objects with opposite charges attract each other because the different charges want to enter a state of balance with each other. Objects can get a negative charge by picking up electrons from other objects. For example, when your shoes scuff against the rug, your shoes are actually picking up electrons from the rug. The electrons fly over your body, giving you a negative charge. Your new electrons fly over your body because they are looking for a positive charge. If you touch a metal doorknob, the electrons on your body will leap into the metal, attracted by the protons there. The transfer of electrons is actually a small electrical current, and produces the tiny electric shock you feel. Lightning is like static electricity, except on a much bigger scale. Both lightning and static electricity happen because of the attraction between the opposite charges. Lightning may not seem much like static electricity, but it's actually very similar. Both are sparks of electricity created through the attraction of unlike charges. The difference is that static electricity creates a small spark, while lightning is a huge spark of electricity. In storm clouds, tiny particles in the cloud move around picking up positive or negative energy charges, like when shoes scuff a rug. The positive charged particles stay light, and rise to the top of the cloud. The negative charged particles get heavier, and collect at the bottom of the cloud. As more particles become charged, they divide into opposing groups in the cloud. When the power of attraction between them gets too great, the particles discharge their energy at each other, completing a path for electricity to travel through the air. We call this flow of electricity lightning. 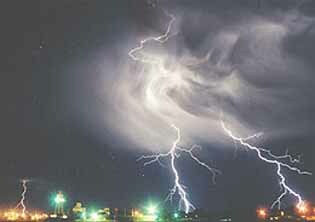 It's the negative charges in the bottom of the cloud that cause lightning to strike the ground. When the negatively charged particles group together, they begin to seek out positive charges from the ground below. The excess electrons create a channel of charged air called a leader that reaches down to the ground below. The leaders attract other charged ground-based channels called streamers. When the stepped leader from the cloud meets a returning streamer from the ground, the path is ready. An electrical current called the return stroke, travels back up the path. This return stroke releases tremendous energy, bright light and thunder. The typical stroke can last only 30 milliseconds, so four to five strokes may happen in the blink of an eye. Despite the old saying, lightning does strike the same place twice. To review, lightning is created by the attraction between opposite charges, the same force that creates static electricity. But lightning uses huge opposite charges to produce an electrical current that's nothing like what you'd get from static electricity. Positive lightning makes up less than 5% of all lightning. It occurs when the stepped leader forms at the positively charged cloud tops, with the consequence that a positively charged streamer issues from the ground. The overall effect is a discharge of positive charges to the ground. Statistics (based on a small number of measurements): an average bolt of positive lightning carries a current of 300,000 amperes, transfers a charge of up to 300 coulombs, has a potential difference up to 1 gigavolt (a thousand million volts), and lasts for tens or hundreds of milliseconds. A bolt of lightning usually begins when an invisible negatively charged stepped leader stroke is sent out from the cloud. As it does so, a positively charged streamer is sent out from the positively charged ground or cloud. When the leader and streamer meet, the electrical discharge takes place up the streamer into the cloud. This return stroke is the most luminous part of the strike, and the part that is really visible. Most lightning strikes usually last about a quarter of a second. Sometimes several strokes will travel up and down the same leader strike, causing a flickering effect. 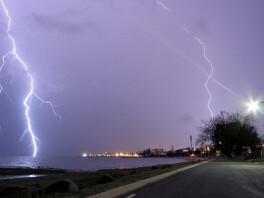 Thunder is caused when the discharge rapidly super heats the air around the strike, causing a shock wave to be sent out. Research published in 2002 indicates that every lighting bolt also causes a similar but weaker electrodynamic pulse in the mesosphere, located 50 to 80 km (31 to 53 miles) above the earth, and above into the thermosphere. This type of lightning is known as negative lightning due to the discharge of negative charge from the cloud, and accounts for over 97% of all lightning. Statistics: an average bolt of negative lightning carries a current of 30 kiloamperes, transfers a charge of 5 coulombs, has a potential difference of about 100 megavolts, and lasts a few milliseconds. Bipolar lightning occurs when bolts of negative and positive lightning alternately use the same channel through the air. Intracloud lightning is the most common type of lightning which occurs completely inside one cumulonimbus cloud, jumping between different charged regions within the cloud. Intracloud lightning is commonly known as sheet lightning because it lights up the cloud and the surrounding sky with an apparent sheet of light. One special type of intracloud lightning is commonly called an anvil crawler. Discharges of electricity in anvil crawlers travel up the sides of the cumulonimbus cloud branching out at the anvil top. Cloud-to-cloud lightning is the most common type of lightning which occurs completely inside one cumulonimbus cloud, jumping between different lightning is a somewhat rare type of discharge lightning between two or more completely separate cumulonimbus clouds. Forked lightning is one of the most visible parts of a thunderstorm. The lightning stroke is branched and usually follows a zigzagging pattern. Forked lightning can go from cloud-to-ground, cloud-to-cloud, or cloud-to-air. The lightning mostly travels from cloud-to-cloud and only goes from the cloud to the ground 20% of the time. Cloud-to-air is the most uncommon form of forked lightning, but when it does happen it may appear that the lightning appears from no where if the sky above the cloud is clear and the lightning may reach up to ten miles away from the cloud. Ground-to-cloud lightning is a lightning discharge between the ground and a cumulonimbus cloud from an upward-moving leader stroke. Most ground-to-cloud lightning occurs off of tall buildings, mountains and towers. Cloud-to-ground lightning is a great lightning discharge between a cumulonimbus cloud and the ground initiated by the downward-moving leader stroke. This is the second most common type of lightning. One special type of cloud-to-ground lightning is anvil lightning, a form of positive lightning, since it emanates from the anvil top of a cumulonimbus cloud where the ice crystals are positively charged, and is a form of positive lightning. In anvil lightning, the leader stroke issues forth in a nearly horizontal direction till it veers toward the ground. These usually occur miles ahead of the main storm and will strike without warning on a sunny day. They are signs of an approaching storm. 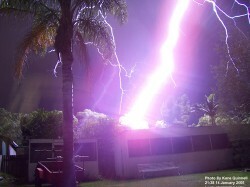 Cloud-to-ground lightning is the most damaging and dangerous form of lightning. Although not the most common type, it is the one which is best understood. Most flashes originate near the lower-negative charge center and deliver negative charge to Earth. However, an appreciable minority of flashes carry positive charge to Earth. These positive flashes often occur during the dissipating stage of a thunderstorm's life. Positive flashes are also more common as a percentage of total ground strikes during the winter months. 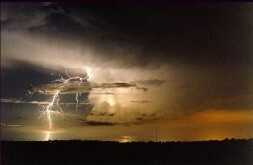 Often, cloud-to-ground lightning bolts strike the highest object, like the top of a building or the top of a tall tree. The lightning strikes can cause fire and property damage. If a person is the highest object in the lightning bolt's path, the lightning may strike the person. Lightning strikes can cause severe injury or death. Cloud-to-ground lightning is the best understood type of lightning because it leaves so much evidence behind. Anvil Lightning - A cloud-to-ground lightning flash that arcs horizontally away from the parent thunderstorm to strike the ground some distance away. Since these 'bolts from the blue' deceptively strike ground directly below sometimes clear skies, they present a danger to the safety of anyone within several miles of a storm. 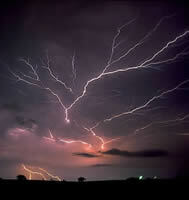 Anvil Crawler Lightning that branches upward and outward like a tree along the tops and sides of large thunderstorms. The lightning seems to 'travel' or 'crawl' across the sky, as in the slow-motion movie at right. Anvil crawlers are also sometimes referred to as spider lightning. Reports by scientists of strange lightning phenomena above storms date back to at least 1886, however it is only in recent years that fuller investigations have been made. Sprites are now well documented electrical discharges that occur high above the cumulonimbus cloud of an active thunderstorm. They appear as luminous reddish-orange neon-like flashes, last longer than normal lower stratospheric discharges (typically around 17 milliseconds), and are usually spawned by discharges of positive lightning between the cloud and the ground. These are images of sprites that are occurring in about 200 milliseconds. Sprites usually occur in clusters of two or more simultaneous vertical discharges, typically extending from 65 to 75 km (40 to 47 miles) above the earth, with or without less intense filaments reaching above and below. Sprites are preceded by a sprite halo that forms due to heating and ionization less than 1 milisecond before the sprite. Sprites were first photographed on July 6, 1989, by scientists from the University of Minnesota and named after the mischievous sprites in the plays of Shakespeare. They are caused by the electric field of a lighting stroke - as opposed to the electromagnetic pulse that causes a sprite. Recent research carried out at the University of Houston in 2002 indicates that some normal (negative) lighting discharges produce a sprite halo, the precursor of a sprite, and that every lightning bolt between cloud and ground attempts to produce a sprite or a sprite halo. According to Stanford's Star Lab Researchers Sprites Formed when there is a positive cloud-to-ground lightning strike, the positive charge of the cloud is stripped away. Positive cloud-to-ground lightning has a powerful, although brief, effect on the atmosphere above the storm. An electrical field that stretches from the top of the storm to the top of the atmosphere is created because the negative layer above the storm remains when the positive charge is drained from the cloud. This field accelerates electrons in the atmosphere. When these accelerated electrons run into nitrogen molecules, energy is given off in the form of light which is mostly red. This light is a sprite. While the sprite is forming, positive charges in the atmosphere are attracted to the negative layer in the atmosphere. his neutralizes the negative layer and causes the electrical field to collapse. According to Physicist Robert Roussel-Dupre of Los Alamos National Laboratory Cosmic rays continuously bombard the atmosphere from space. These high energy charged particles run into molecules and free electrons. If this were to occur in an electrical field above a thunderstorm as seen above, it would cause an avalanche of electrons flowing upward. This leads to lower energy electrons that make nitrogen molecules glow causing a sprite. There are colors in sprites that are not seen in typical lightning discharges. This is because there are fewer air molecules involved in sprites than in lightning because the atmosphere is less dense with increasing altitude. Sprites chemically modify the atmosphere. During a sprite, there is ionization of nitrogen. Because there is low mobility in the upper atmosphere, this ionized nitrogen remains mostly where created. This can lead to the development of more sprites. It may also have more far reaching consequences like effecting the reactions of greenhouse gases, the creation of ozone, and even effecting the global climate. These effects are not fully known and are still being researched. It is also possible that sprites could be a hazard for airplanes and space shuttles. This shows one sprite that leads to the development of more sprites. Another special type of cloud-to-ground lightning is bead lightning. 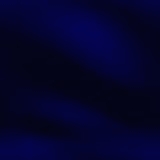 This is a regular cloud-to-ground stroke that contains a higher intensity of luminosity. When the discharge fades it leaves behind a string of beads effect for a brief moment in the leader channel. A third special type of cloud-to-ground lightning is ribbon lightning. These occur in thunderstorms where there are high cross winds and multiple return strokes. The winds will blow each successive return stroke slightly to one side of the previous return stoke, causing a ribbon effect. The last special type of cloud-to-ground lightning is staccato lightning which is nothing more than a leader stroke with only one return stroke. Heat lightning is nothing more than the faint flashes of lightning on the horizon from distant thunderstorms. Heat lightning was named because it often occurs on hot summer nights. Heat lightning can be an early warning sign that thunderstorms are approaching. In Florida, heat lightning is often seen out over the water at night, the remnants of storms that formed during the day along a seabreeze front coming in from the opposite coast. Elves appear as a dim, flattened expanding glow around 400 km (250 miles) in diameter that lasts for, typically, just one millisecond. They occur in the ionosphere 100 km (60 miles) above the ground over thunderstorms. Their color was a puzzle for some time, but is now believed to be a red hue. Elves were first recorded on another shuttle mission, this time recorded off French Guiana on October 7, 1990. Elves is a frivolous acronym for Emissions of Light and Very Low Frequency Perturbations From Electromagnetic Pulse Sources. This refers to the process by which the light is generated; the excitation of nitrogen molecules due to electron collisions (the electrons having been energised by the electromagnetic pulse caused by a positive lightning bolt. On September 14, 2001, scientists at the Arecibo Observatory photographed a huge jet double the height of those previously observed, reaching around 80 km (50 miles) into the atmosphere. The jet was located above a thunderstorm over the ocean, and lasted under a second. Lightning was initially observed traveling up at around 50,000 m per second in a similar way to a typical blue jet, but then divided in two and speeded to 250,000 m / second to the ionosphere, where they spread out in a bright burst of light. On July 22, 2002 five gigantic jets between 60 and 70 km (35 to 45 miles) in length were observed over the South China Sea from Taiwan, reported in Nature. The jets lasted under a second, with shapes likened by the researchers to giant trees and carrots. 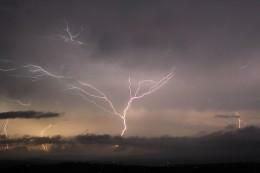 Researchers have speculated that such forms of upper atmospheric lightning may play a role in the formation of the ozone layer. Ball lightning is a natural phenomenon, or debatably, a pseudoscientific theory. It is sometimes associated with thunderstorms. It takes the form of a long-lived, glowing, floating object, as opposed to the short-lived arcing between two points commonly associated with lightning. An early attempt to explain ball lightning was recorded by Nikola Tesla on March 5, 1904 (Electrical World and Engineer). Some laboratory experiments claim to produce ball lightning, but there is no consensus that the phenomenon reproduced is related to the natural one. 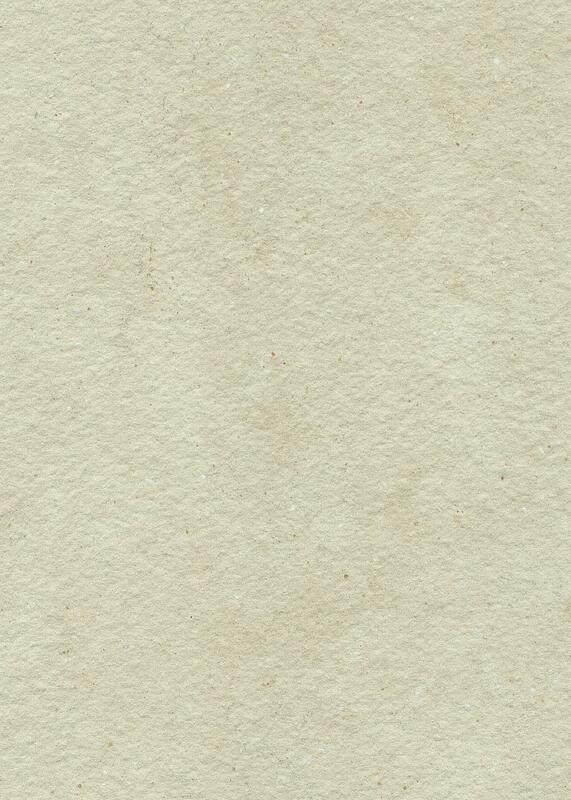 The natural occurrences are, by their nature, difficult to document accurately. 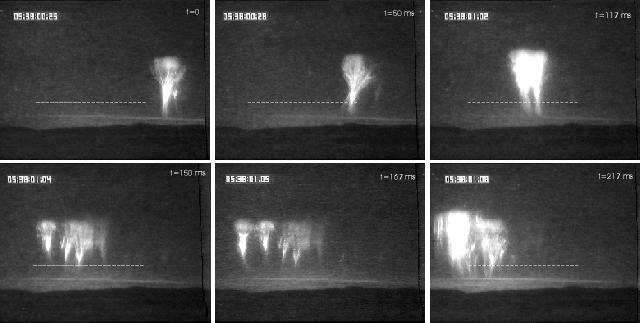 Consequently many scientists continue to dispute the existence of ball lightning as a distinct physical phenomenon (see, for example, the review by Singer (2002)). In one such occurrence, Singer reports that staff at the Cavendish Laboratory, Cambridge apparently saw ball lightning, although Brian Pippard, the Head of Department, was skeptical on its reality. For a long time the phenomenon was treated as myth. Although speculation continues, there is now agreement that it is neither mythical nor purely psychological. Surveys have been taken of eyewitness accounts by at least 3000 people, and it has been photographed several times. There is as yet no widely accepted explanation.Difficult features of the lightning include its persistence and its near-neutral buoyancy in air. 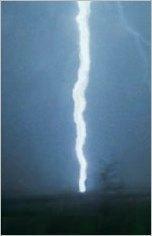 Until February of 2006 there was no convincing laboratory demonstration of ball lightning. In that month, Israeli scientists announced that they had created a short-lived effect using the same technology found in microwave ovens. A popular hypothesis is that ball lightning is a highly ionized plasma contained by self-generated magnetic fields: a plasmoid. This hypothesis is not initially credible. If the gas is highly ionized, and if it is near thermodynamic equilibrium, then it must be very hot. Since it must be in pressure equilibrium with the surrounding air, it will be much lighter and hence float up rapidly. Magnetic fields, if present, might provide the plasmoid's coherence, but will not reduce this buoyancy. In addition a hot plasma cannot persist for long, because of recombination and heat conduction. There may, however, be some novel form of plasma for which the above arguments do not fully apply. For example, a plasma may be composed of negative and positive ions, rather than electrons and positive ions. In that case, the recombination may be rather slow even at ambient temperature. One such theory involves positively charged hydrogen and negatively charged nitrites (NO2­) and nitrates (NO3­). In this theory, the role of the ions as seeds for the condensation of water droplets plays an important role.